The Dollar Box: Face-To-Face With … The Lizard! Welcome to The Dollar Box, where I look at classic single-issue stories and short runs of comics with a cover price of a dollar or less. This month’s issue sports a cover price of twelve cents … but good luck finding a decent copy of Amazing Spider-Man #6 for less than a thousand dollars! Classic Stan Lee/Steve Ditko Amazing Spider-Man issues are among the most sought-after by Silver Age collectors, and with a new Spider-Man movie arriving in theaters this week — featuring the Lizard, the villain introduced in this issue — I would expect copies of Amazing Spider-Man #6 to become even more difficult to obtain. 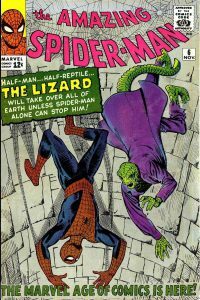 Amazing Spider-Man #6 — “Face-To-Face With … The Lizard!” — is a typical Stan Lee & Steve Ditko Spider-Man of the era, which is to say that it is fast-paced, colorful, melodramatic … and more sophisticated than it might appear. Silver Age books adhere to a different idiom than contemporary titles, and with their soap opera dialogue and characters who speak their feelings aloud, these stories can be a hard read for fans accustomed to the more popular decompressed and cinematic comics of today. There is still much to like in books of this era, even beyond their historic value, and once you develop an “ear” for this kind of storytelling, these classic comics offer as much or more entertainment as any superhero book presently produced by the “Big Two.” I find it helps to think of Silver Age books as Broadway musicals, with all the solo superhero exposition corresponding to those big, single-spotlight moments when a character in a musical spills out their feelings through song. Compared to the shadowy Spider-Man of this week’s new movie, this original Lee & Ditko spin on Spidey might seem too sunlit and corny, but these tales were unique in their day for their portrayal of a real, flesh-and-blood teenagers, with real teenager problems. We take for granted that superheroes are real people beneath their masks, with frustrations and challenges like the common Joe, but this multi-dimensional look at what made superheroes tick was what really put Marvel Comics on the map in the early 1960s, beginning with Fantastic Four, and then scoring a direct hit with Spider-Man, where teenaged Peter Parker appealed directly to the teen and tween readers of the day. 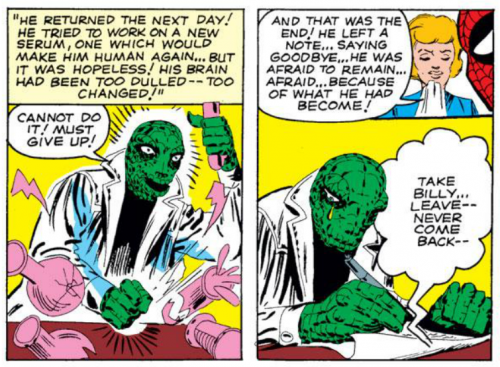 “Face-To-Face With … The Lizard!” is a lesser Spidey story, memorable mostly for its stellar creative team, and for the first appearance of The Lizard, himself a second-tier Spider-Man villain, but due now for at least fifteen minutes of fame thanks to his cinematic incarnation. The story is pretty by-the-numbers — Spidey is challenged by the villain-of-the-month, Spidey fights the bad guy and solves the mystery, and Peter Parker navigates the treacherous shoals of his private life, dealing with his overprotective aunt, his overbearing boss, and the girls that come in and out of his teenage life. While issue is enjoyable as a simple adventure tale of a bygone era, it’s more interesting to evaluate it by its many tropes, which have gone on to become pillars of the Spider-Man myth (and also of practically every other superhero comic). In Spider-Man, creators Lee & Ditko wanted to show us that superpowers can’t solve everything. 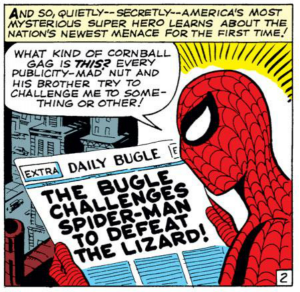 For all his alter-ego’s fame, Peter Parker is perpetually short of cash, and in this tale Parker has to trick his foil, newspaper editor J. Jonah Jameson, into paying for his plane ticket to Florida by getting Jonah to send him on a photo assignment so that he can answer a public challenge from the mysterious Lizard. 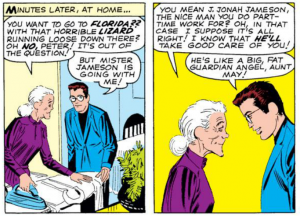 Even then, Peter has to secure permission from his aunt to go on the trip, and then he has to put up with Jameson coming along, making it that much tougher for Peter to get pictures of himself in action as Spider-Man. 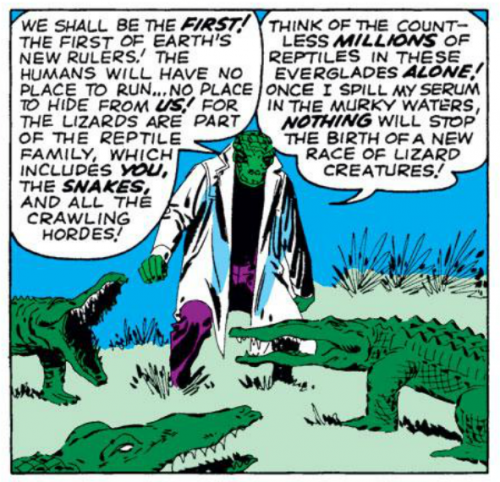 The impact of science — for good or for ill — was a common theme in many Silver Age books, and Amazing Spider-Man #6 was no exception. Doctor Curt Connors first becomes the Lizard as a side-effect of a serum he was testing to help amputees everywhere by restoring his own lost limb. Amazing Spider-Man #6 soft-pedals this trope of science gone mad, with Spidey using his powers for positive good. Spider-Man is also viewed in a rare heroic light by Dr. Connor’s family, when Parker uses his brains as well as his fists, concocting an antidote to free Connors from his wretched transformation. Many issues of Amazing Spider-Man have Peter Parker regarding his powers as a curse — the powerlessness of this most powerful of heroes is a recurring theme, as time and again Spider-Man is hounded by J. Jonah Jameson, puts his loved ones in danger, or forced to forgo a normal teen life of friends and fun owing to the demands of his costumed identity. 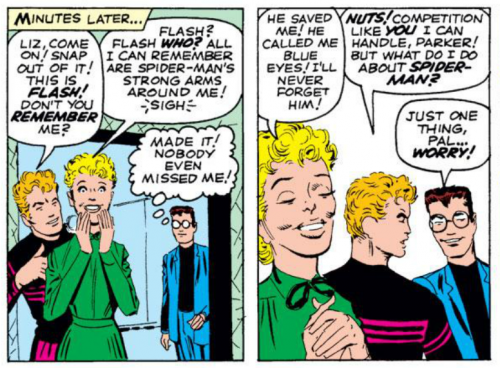 In this issue, though, about as bad as it gets for Peter is when he discovers he’s become his own romantic rival for Liz Allen’s affections, but there’s more irony than angst in this particular episode. The action is tight and well-choreographed in the classic Ditko style, where panels aren’t sparse so much as entirely focused on those few details that Ditko wants you to see. The climactic battle with the Lizard and his alligator army is a little less than spectacular, but an earlier encounter when Spidey takes on some common hoods has delightful moments, such as when Ditko captures this picture perfect moment of action and reaction. 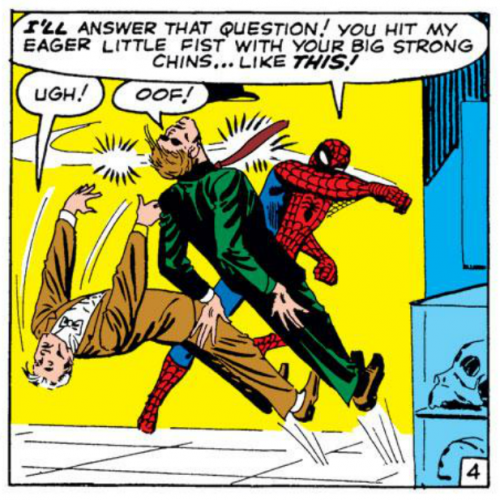 This panel could serve as an animation key frame, so vivid that it is impossible not to see motion in the mind’s eye, and “hear” Spidey’s fist taking the bad guys on the chin. After a tight twenty-two pages, our tale is over, and it is an unusually upbeat ending for an early Spider-Man comic. Doctor Connors is cured, Parker gets the last laugh on J. Jonah Jameson by sending him a taunting letter, and Peter seems more amused than upset that Liz Allen has no real interest in him. 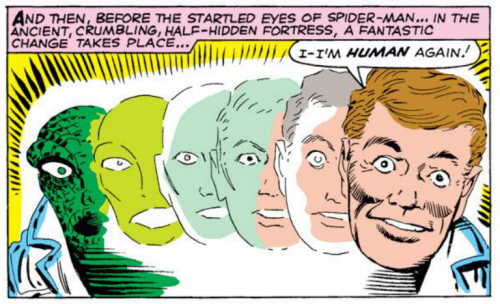 It’s a contrast with most books of the Lee/Ditko run, which while less shadowy than the current film, were full of shadows of their own — but they were internal shadows, the shadows of doubt and inadequacy that Peter Parker thought were his alone, but which of course are universal human failings, and it is in exploring these interior landscapes that Spider-Man transcended comics of the day and became a permanent part of our popular culture. Thanks for reading this month’s Dollar Box, and remember … if you see this book for less than a dollar, buy it for me! I’ll see you back here the first Wednesday of August for another installment, and in the meantime, please visit me at my home blog — Longbox Graveyard — which today features a review of the full thirty-eight issue Lee/Ditko run on Amazing Spider-Man! Please re-release Lee/Ditko era Spider-Man comics in digital format with a soundtrack of Stan Lee singing the dialog. You know, Jason, if Smiling Stan thought there was a nickle in it, I’m sure he’d be happy to oblige.